Please the Request for Proposal (RFP) template below for each business applications listed. All you need to do is scroll to your desired RFP template by alphabetize order. Each Infotivity RFP Template listed below is also provided at NO additional charge a complete vendor response evaluation and comparison templates. Please call 888-517-8669 to obtain expert advice about which template is best for your needs! You may also want to view the list of RFPs for vertical distribution industries at the bottom of the ERP for Distributors page. This template is designed for selecting a complete building management software system, and queries vendors about badge, key and visitor management, alarm and threst management, HVAC and elevator control, and much more. NOTE: You can use the CRM Insider's Unbiased Step-by-Step Guide to select CRM software more accurately! This collection of RFPs and ERP requirements checklists templates focuses on distribition industry applications. A wide range of frequently encountered ERP software for distribution operating environments is addressed, ranging from general purpose to petroleum distribution. An example RFP or criteria samples are available on the applicable page. A Request for Proposal Template and Vendor Response Evaluation Toolkit is available for a wide assortment of horizontal and vertical Enterprise Resource Management (ERP) Systems applications. A wide variety of frequently encountered ERP software application environments is addressed, ranging from general purpose to ERP for specific vertical industries. ERP RFP examples or samples of each type are available for each template on the applicable page. 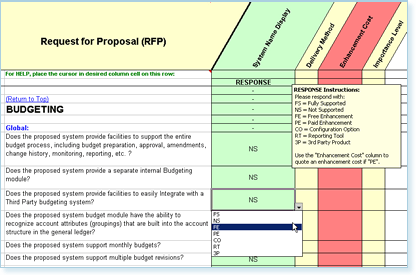 This group of Request for Proposal Template is also known as Computer Aided Facilities Management (CAFM) Software. All CAFM Software RFP Templates and CAFM requirements checklists focus on facilities management oriented applications. A wide variety of frequently encountered CAFM software application types are addressed, ranging from general purpose to CAFM for Hospitals. CAFM RFP examples or samples of each CAFM software RFP type are available on the applicable page. The healthcare RFP and Healthcare requirements templates below focus on healthcare applications. A wide range of frequently encountered healthcare software applications are addressed, ranging from general purpose healthcare ERP to staff scheduling. The Human Resource Management Request for Proposal Template and HRIS requirements templates below focus on HR applications. A wide range of frequently encountered HRM software applications are addressed, ranging from general purpose HR to HRIS outsourcing. HR RFP examples or samples of each type are available for each template on the applicable page. This template collection for Point of Sale (POS) software selection includes many Request for Proposal Template with Software Selection Toolkits focuses on different POS applications. A number of frequently occurring POS software environments is addressed, from general purpose use to specialized POS systems for vertical industries. This collection of TMS system Request for Proposal Template with Software Selection Toolkits focuses on TMS applications. A wide variety of frequently encountered TMS software configuration applications is addressed, ranging from general purpose to combined TMS - WMS functionality. All templates listed above come with a matched Software Selection Toolkit & Decision Matrix that contains a comprehensive set of RFP response comparison, evaluation guide, and software selection tools. Save time preparing your RFP, save even more time evaluating vendor responses, and more accurately select the BEST software solution, all by using an Infotivity RFP Template as a blueprint for success! NOTE: Many of our RFP pages is under going new construction sorry for the inconvenience. If you do not see an RFP you are interested in please Contact Us! We will send you samples customized to your needs. Receive FREE Advice & Support from RFP Experts! Return to the TOP of the RFP Template Toolkit Page. How NOT to Write an RFP! 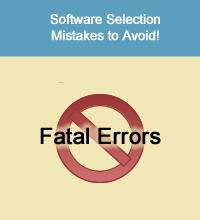 RFP Template Toolkits for Software Selection! The above RFP Template and Response evaluation toolkits provide ALL the tools described above, i.e., the templates needed to quickly gather user needs, quickly and accurately determine system requirements, distribute RFPs, prevent vendor mistakes and ripoff, compare & evaluate vendor RFP responses (proposals), and select the software solution best for your organization's needs. Carnegie Mellon Software Engineering Institute (SEI). are trademarks of Infotivity Technologies, Inc.